Castle Comfort Stairlifts offers top brand stairlifts, keen prices and fast installs for all those seeking stairlifts Cheshire. And all work comes with our no-quibble guarantees and famous customer service satisfaction so give us a call on 01625 886 599. If however, you are looking for information about the area then feel free to read on below - and our sister blog - you'll find fascinating facts with Castle Comfort Stairlifts. Macclesfield is known as the Silk Town because at one time it had lots of Silk mills and was the biggest silk manufacturing town in the UK. Aswell as fine textiles it is also the home of high-end furniture retailer Arighi Bianchi. Another high-end destination around Macc, as the locals call it is The Cat and Fiddle Pub which draws people with its claim of being the highest pub in Britain and is located on one of the most challenging driving roads in Britain. The local radio station is named after the silk mill heritage namely 106.9 Silk FM and can be heard right across the Cheshire East region from Macclesfield to Wilmslow and Alderley Edge. These are all places where our Cheshire stairlifts engineers have completed installations. The town has a famous named castle landmark associated with it, (other than the Castle Comfort Stairlifts Macclesfield office!) which at different times has also been called Buckingham Palace, though according to Wikipedia it is more commonly known as Macclesfield Castle. Built in 1398 the castle was really a large manor house which over the years has become more derelict until it was turned into housing and shops, like a lot of the Silk mills have too. The most famous silk mill was known for being the original Hovis Factory where the wholemeal loaf was made before production changed to the premises at Trafford Park in Manchester. Alderley Edge is a beautiful village in the Cheshire Golden Triangle. That's not the name of the local Chinese takeaway! It's a triangle of the 3 towns of Wilmslow, Macclesfield and Alderley Edge inside of which live one of the highest concentrations of wealthy people in the country. The area is the home to a number of affluent sports stars, celebrities and business people, many of whom are multi-millionaires. Alderley Edge high street bristles with chic restaurants, designer shops and speciality food shops, including traditional butchers, florists and local produce shops. The town's Aston Martin dealership sells the highest number of Aston Martins in the UK. Wilmslow falls within the political constituency of Tatton, a strongly Conservative constituency represented by George Osborne, the current Chancellor of the Exchequer. Is Maccledsfield really the Silk Town? Good, 'cause we'll call Castle Stairlifts as my wife is so fussy, she said she'd only look getting a stairlift when they were made out of silk! Thankyou Mr Lemon - a little typo - it is Macclesfield .. not Maccledsfield. Stairlifts in Macclesfield? Mill Street could do with one - it's too steep! There seems to be lots of stairlifts firms in Cheshire. What makes yours any different? I live near Buxton but we have a Stockport postcode so officially we are in Cheshire. But it took me quite a while to find you as when I put in stairlifts cheshire your local office didn't appear until I zoomed in nearer to my house. Does this google map thing work? Do you install home elevators, like the lifts you get in a small hotel? We are currently having our 3 storey home remodelled and it looks like my mother will be needing to come and live with us as I don't want her in a care home. Thank you for bringing this to our attention. We'll tell Google - they always respond to us. Our records show that whilst we have installed more stair lifts this year in Cheshire than every before - enquiries via the Google map are a bit lower than other United Kingdom areas. Setting up the Google map depends on many things and Google's 'algorithms' (the rules) are very complex and change daily. If you search just 'stairlifts' though as opposed to 'stairlifts cheshire' you’ll see our main website on page 1! It took us many years to earn that. Ah - just spotted Anon's question - what makes us any different? Well, in a nutshell (that's Acorn Stairlifts catch phrase.. which is just one of the firms we deal with)we are on your side. We represent you as well as all the companies from whom you may choose to place your business. If you approach yourself, and negotiate direct with a stairlift company, you will have their rep or agent giving you their company's line. May be all good stuff - but with Castle Comfort Stairlifts you'll not only have a choice and as many quotes as you wish, you'll have our advice and back-up regarding any ongoing issues connected with your purchase. Just remember that well over half of enquiries we received come folk who have been recommended. Usually my mother stops with us for christmas but her arthritis is preventing her climbing the stairs safely. 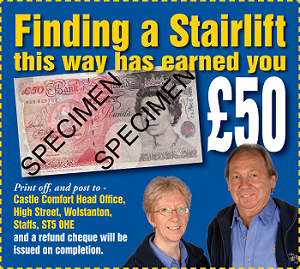 Would you do a rental stairlift as long as we were still in Cheshire, just upto the new year? Yes Mr Barnes. 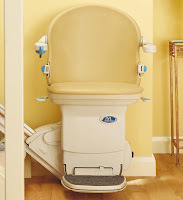 But stairlift rentals incur install an removal costs as well as the rent. Presumably your mother comes often or even if just for xmas then buying one may be useful for future years. The slimline stairlifts we do fold away when not used, and are therefore unobrusive. We suggest you get a quote for purchase and rental and weigh it up. Costs of new chairlifts have come down a lot in recent years and if bought, and then unwanted one day - there are lots of firms- especially in Cheshire, buying them back for good money.